Galleries: Perpendicular to the two new volumes runs a gradually widening promenade gallery touring a galaxy of contemporary artworks, from Barnett Newman's iconic zip paintings (Onement VI, 1953) to Nathalie Djurberg's bizarre Potato (2008) in a daisy-chain sequence of expanding rooms. The golden Haunted House interior is currently the playground of the artist Robert Gober, whose installations occupy all floors. The linear, serial viewing experience has produced a daringly cinematic and unconventional approach to the staging of art works. Early in the sequence, a quasi-domestic setting frames the abstract Newman, besides which a little staircase leads up to a private eyrie, an artist's residence overlooking the Fondazione's courtyard. Later, there's a room swathed in Corten-coloured velvet and a brave, busy, teen-bedroom display of Jeff Koons and other graphic works. The procession of uniquely curated rooms terminates in the largest single space in the complex, the Great Hall - a vast, garage-like storage space which appears barely to have had a wash and wipe before being littered with vintage cars, customised by Elmgreen & Dragset among other artists. 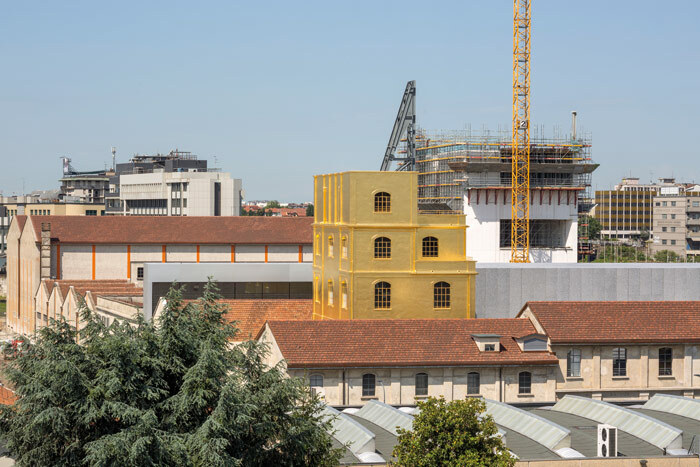 Indeed, the general treatment of the historic distillery buildings shows an apparent underplay. Things seem to be left in the raw: stripped back with little obvious treatment, and where possible retaining original details like the steel framed windows, which remain workable even in the gallery spaces. The sleek mirrored walls of the auditorium fold up like a Lotus sportscar, opening the space up to the courtyard. 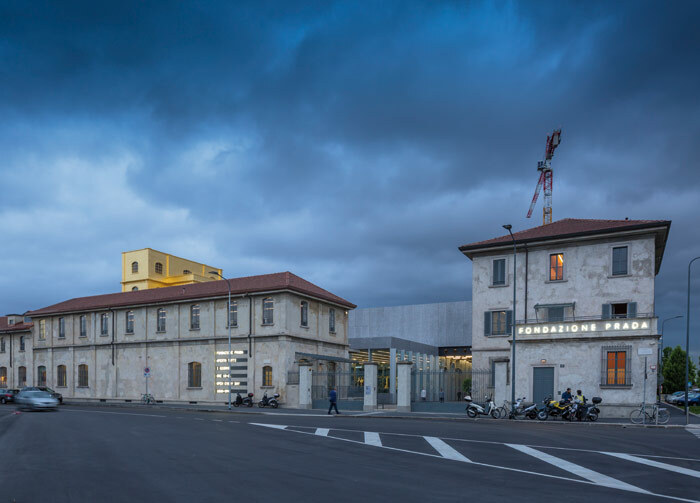 In the Cisterna - the building where vast stills once created their magic liquor -- bare concrete volumes are used to dramatic effect, challenging singular works to respond to multiple points of observation. Pulpit balconies and openings for light or access punctuate three individual tank-rooms (aka Trittico, the triptych), allowing for viewing and circulation of the erstwhile industrial spaces. One room is occupied by Damien Hirst's Lost Love (2000): a tank containing a doctor's chair, surgical paraphernalia, women's jewellery and a couple of dozen lively goldfish. The work lends itself to this peculiarly theatrical staging; the fragile whiff of mortality and pseudo-scientific absurdity blossoms against the unmitigated roughness. 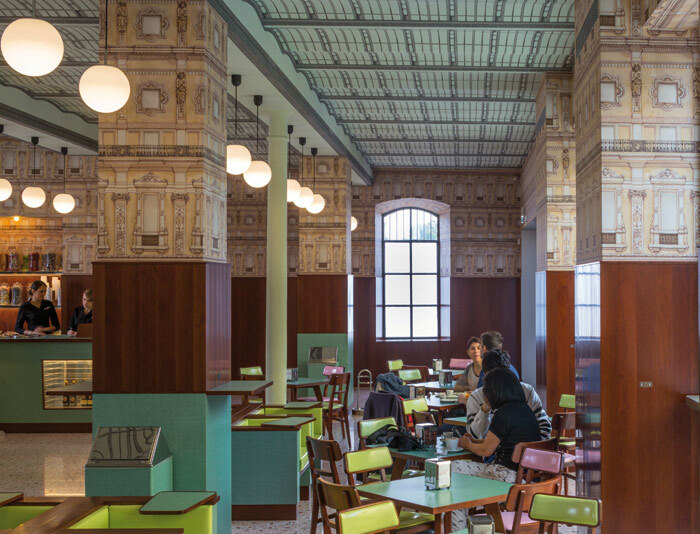 Bar Luce, the fondant fancy bar designed by filmmaker Wes Anderson, recalls Milanese café culture. Of course, leaving things 'raw' can sometimes be the result of a tortuous and considered process. Thick steel reinforcing columns, made mandatory after the 2009 L'Aquila earthquake, reach halfway up the perimeter of the Great Hall's interior, are painted in a bright, mineral orange - not a fashion-inspired colour pop but simply the colour of standard zinc-chrome paint used to prevent corrosion. It transpires that the steel reinforcements have in fact been painted orange, black, white, and back again to orange half a dozen times. In the industrial warehouse of the Great Hall, the vast wall spaces are articulated by the tangoed steels; elsewhere, similar supports appear in monochrome, and are much less conspicuous. 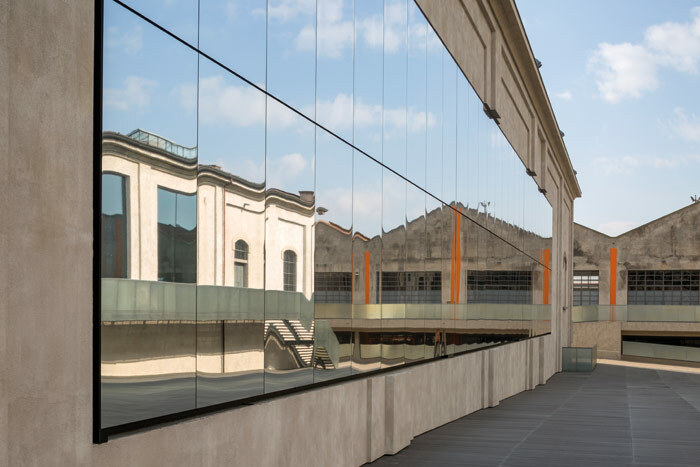 Whole: Like the best of OMA's early buildings, the Fondazione Prada complex presents a deliberate arrangement of contrasting, cacophonous qualities. The result is exquisite tension; historic and new, rough and smooth, industrial and luxe, bristling against each other. 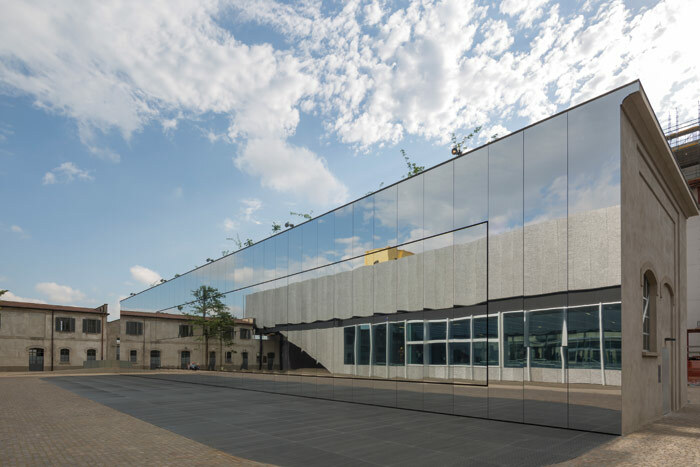 Koolhaas' statement at the opening of the building is as astute and unapologetic as ever: here is a collection of buildings that refuses to coalesce into any logical sequence, axial order or material unity. History and novelty, material and surface, possibility and specificity confront each other, while never quite cohering. 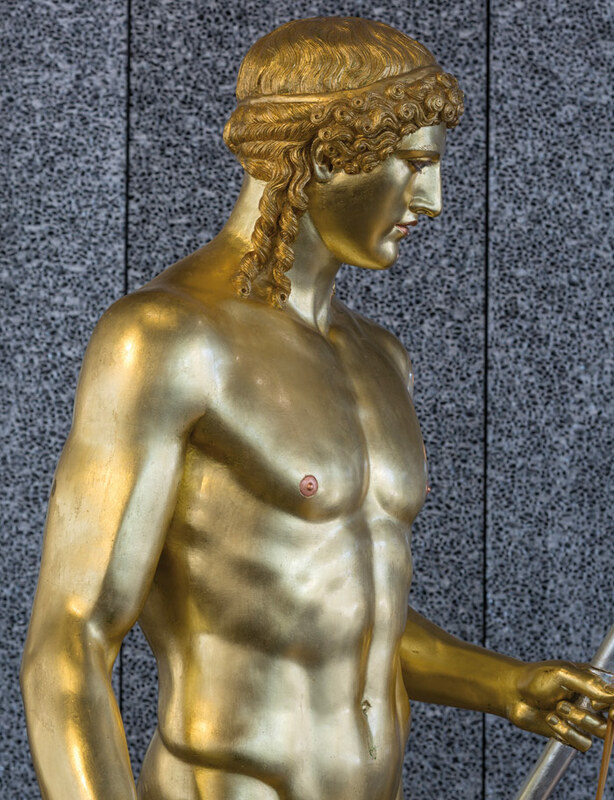 The gilded antiquities shown against an interior surface of aluminium foam is a capsule metaphor for historic contrasts. That might sound like a 'jazz' excuse for failed composition, but the choreographed experience of varied typologies coming together is quite joyful. 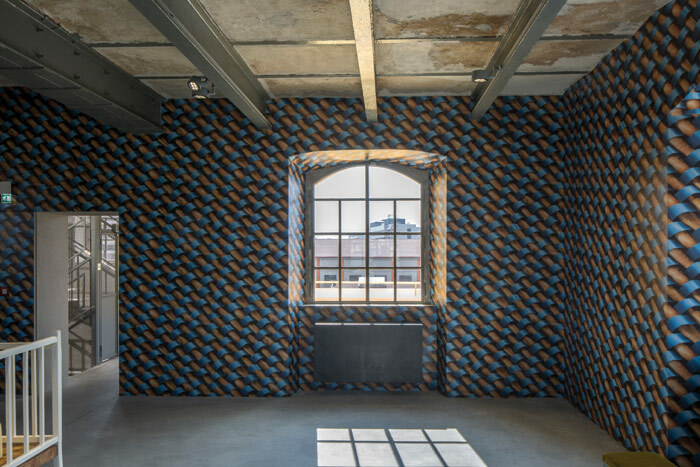 New volumes intersect the old fabric with a sort of thunking precision: slabs of bizarre foamy metal and heavy, structural I-beams almost kiss the limey plaster and pitched cap of terracotta tiles. In the galleries, standard issue fire-exit signs are brazenly visible, beyond the curved musculature of an alabaster statue's arm; thick steel diagonals romp across bubbly aluminium walls, on which priceless works hang. The roof tiles bounce their ruddy glow off the gilded surface of the Haunted House, and if new gallery walls cling lecherously to old windows, even choking them, so be it. This jostling banter of material, surface and volume is both profane and delightful: on one hand so brutal, and on the other sublime.